Amy Sheppard packs up items outside her tent in a Walmart parking lot in Chico, Calif., that's been a makeshift campground for people displaced by wildfire, Nov. 21, 2018. Sheppard lost her home in Magalia to the Camp fire. Amy Sheppard packs her belongings into a plastic garbage bag as rain drips around her, readying to move on from a field by a Walmart where thousands of evacuees had taken refuge from a deadly Northern California wildfire. Heavier rain was expected later in the day in the Paradise burn area, which is about 140 miles (225 kilometers) north of San Francisco, where the Camp Fire has killed at least 83 people and destroyed more than 13,000 homes. Volunteer members of an El Dorado County search and rescue team search the ruins of a home and vehicle, looking for human remains, in Paradise, Calif., Nov. 18, 2018, following a Northern California wildfire. Former California Gov. 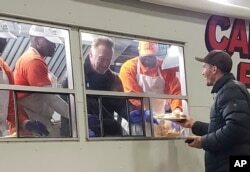 Arnold Schwarzenegger serves breakfast to firefighters, Nov. 21, 2018, in Chico, Calif. Schwarzenegger has made a surprise visit to firefighters battling a deadly blaze in Northern California, helping serve them breakfast while providing encouragement. In Northern California, the wildfire that started two weeks ago has torched an area in Butte County about the size of Chicago — nearly 240 square miles (622 square kilometers) — and was 80 percent contained. Former California Gov. Arnold Schwarzenegger made a surprise visit to weary firefighters Wednesday, providing encouragement and helping serve breakfast. “I wanted to let you know how much I appreciate all the work that you do,’’ he told firefighters during a brief speech.